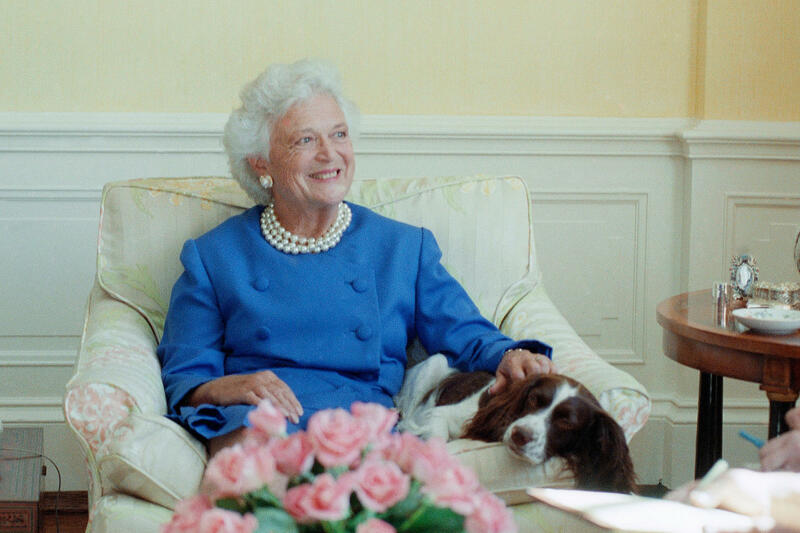 First lady Barbara Bush, with her pet dog Millie, talks to reporters in September 1990 in Washington, D.C. Mrs. Bush said Iraq cannot be allowed to get away with its occupation of Kuwait. She also revealed that Millie has a case of lupus but "she's in complete remission." 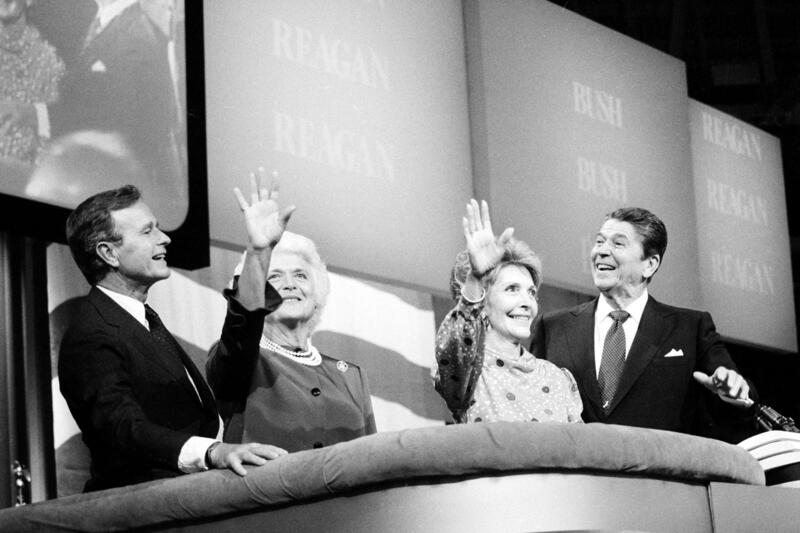 President-elect George and Barbara Bush acknowledge the crowd at a victory celebration rally in Houston on Nov. 8, 1988. The first lady holds hands with 6-year-old Rachel Daly of Cypress, Texas, during a visit to cancer patients at the M.D. Anderson Hospital of the Texas Medical Center in Houston on July 11, 1990. 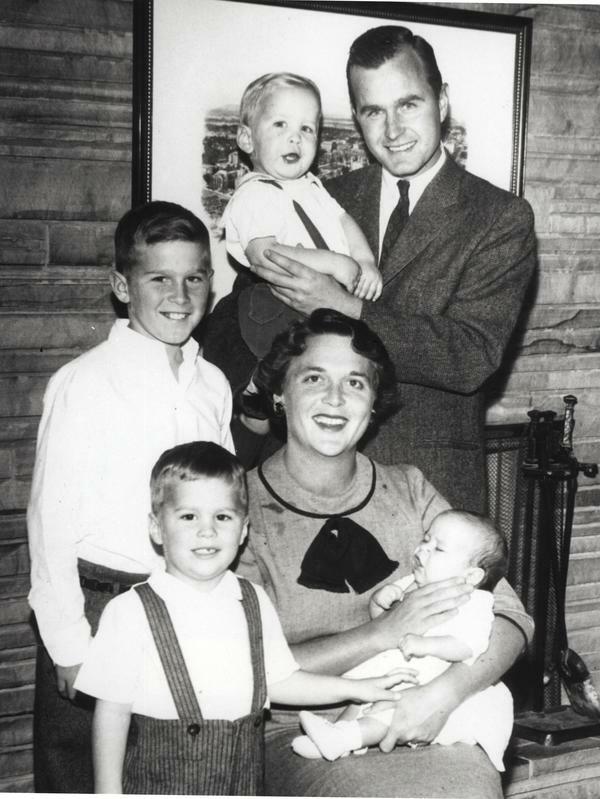 Barbara and George Bush pose with children Neil Bush, George W. Bush, Jeb Bush and Marvin Bush in 1956. 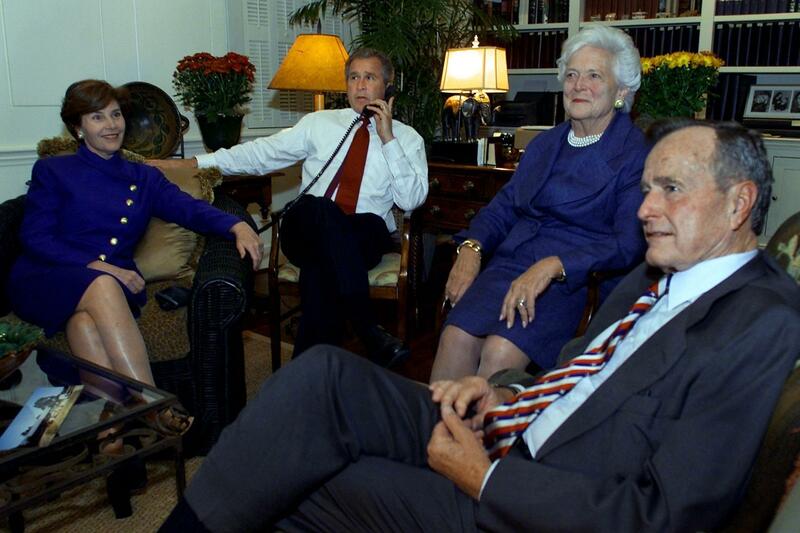 Republican presidential candidate George W. Bush speaks on the phone while watching election returns with his wife, Laura, and parents on election night at the Governor's Mansion in Austin, Texas, on Nov. 7, 2000. Thousands gathered outside the Texas Capitol building to hear Bush speak later in the evening. 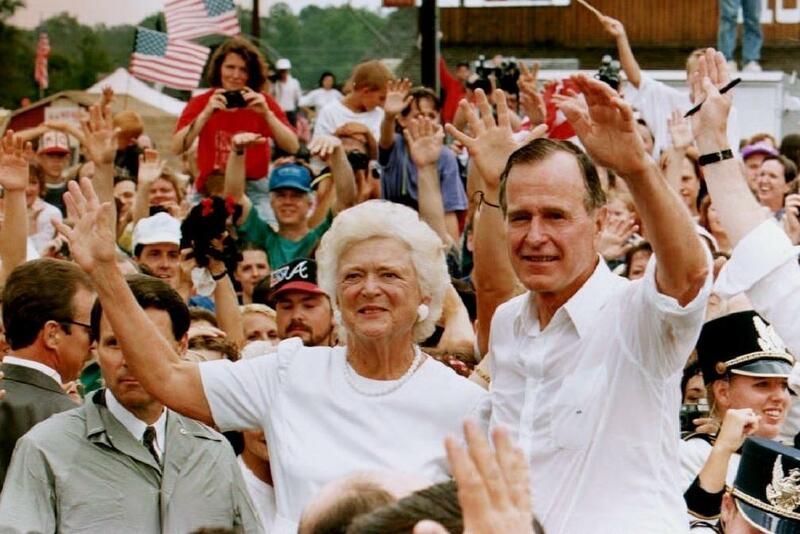 President and Mrs. Bush are surrounded by supporters during a campaign stop in Georgia on Aug. 22, 1992. Bush criticized Democratic presidential candidate Bill Clinton for seeking what he called the largest tax increase in U.S. history. Mrs. Bush talks with Mitt Romney at former President George H.W. Bush's office on March 29, 2012, in Houston. Romney received an endorsement from George and Barbara Bush during the meeting. 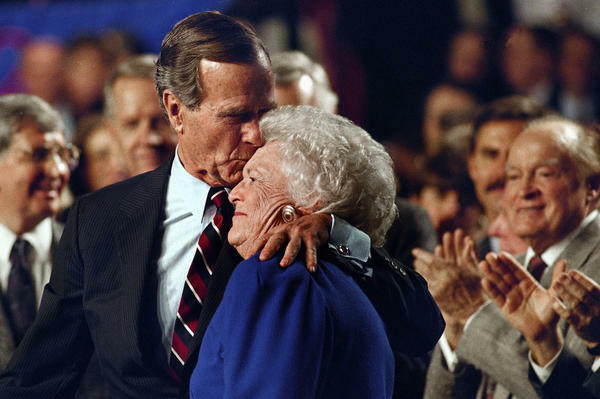 President Bush kisses Barbara during a pre-election rally at the Astro Arena in Houston on Nov. 2, 1992. Mrs. Bush chats with Louisiana State University students as they receive their doctorate degrees on May 21, 1992, in Baton Rouge, La. She was awarded an honorary degree of Doctor of Humane Letters and spoke to the graduates at spring commencement. First lady Barbara Bush, with pet Millie, talks to reporters on Sept. 11, 1990, in the family residence of the White House. Mrs. Bush said Iraq could not be allowed to get away with its occupation of Kuwait. She also revealed that Millie had a case of lupus, but "she's in complete remission." Vice President and Mrs. Bush and President and Mrs. Reagan react to support from delegates on the floor of the Dallas Convention Center at the conclusion of the final session of the Republican National Convention in Dallas on Aug. 23, 1984. George Bush is sworn in as director of the Central Intelligence Agency on Jan. 30, 1976, by Supreme Court Associate Justice Potter Stewart (left) as Mrs. Bush and President Gerald Ford watch at CIA headquarters in Langley, Va. Bush succeeded William Colby, who retired. 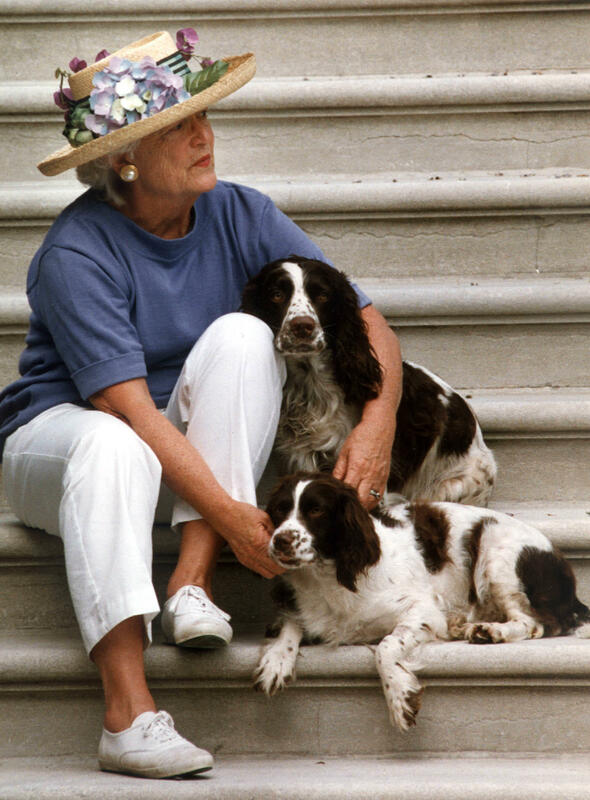 Former first lady Barbara Bush sits with Millie and Ranger on the steps of the South Portico of the White House in 1991. Then-President George H.W. Bush and first lady Barbara Bush wave to supporters in October 1992 at a campaign rally in Springfield, Pa.
"It will not surprise those who know her that Barbara Bush has been a rock in the face of her failing health, worrying not for herself — thanks to her abiding faith — but for others," it said. "She is surrounded by a family she adores, and appreciates the many kind messages and especially the prayers she is receiving." "My dear mother has passed on at age 92. Laura, Barbara, Jenna, and I are sad, but our souls are settled because we know hers was. Barbara Bush was a fabulous First Lady and a woman unlike any other who brought levity, love, and literacy to millions. To us, she was so much more. Mom kept us on our toes and kept us laughing until the end. 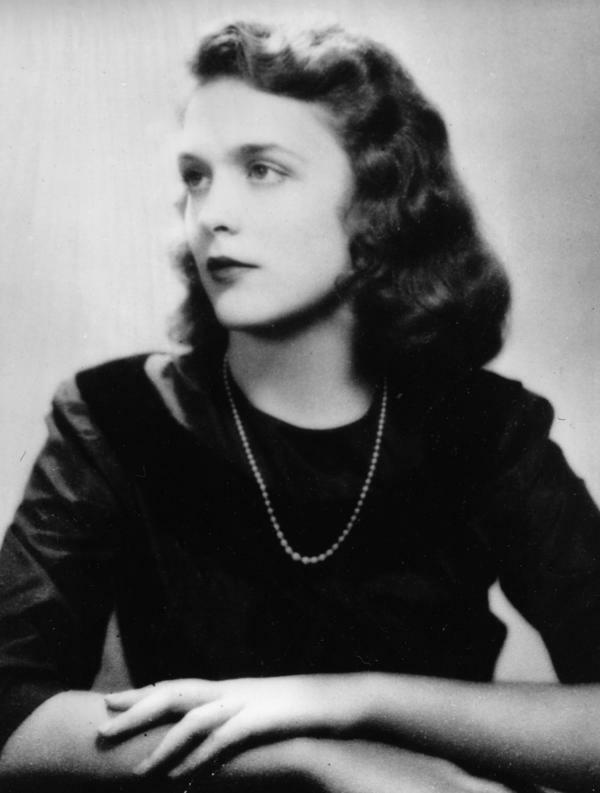 I'm a lucky man that Barbara Bush was my mother. Our family will miss her dearly, and we thank you all for your prayers and good wishes." President Trump and Melania Trump called her an advocate for the American family, with great achievements in the cause of literacy. The president ordered that U.S. flags to be flown at half-staff at the White House, federal buildings, U.S. embassies and military posts in Barbara Bush's honor. Former President Barack Obama and Michelle Obama said they were grateful for her generosity to them and said the way she lived her life was a testament to public service as an important and noble calling, that she was an example of humility and decency. Bush will go down in history as one of just two women to be both the wife of a U.S. president and also the mother of one. She was as famous for her undyed hair and fake pearls as she was for her self-deprecating humor, and she made it clear — from the moment she moved into the White House — that she was going to be a different kind of first lady from her very glamorous predecessor, Nancy Reagan. "Barbara Bush certainly wasn't afraid to laugh at herself," said first lady biographer Myra Gutin. "She worked very hard to show that she was just a real person." Gutin says Bush was popular in part because she was a throwback to old-fashioned values and because she pushed back against popular conventions of beauty. When she was about to become first lady, she quipped, "My mail tells me that a lot of fat, white-haired, wrinkled ladies are tickled pink." "That's vintage Barbara Bush," says Gutin. Her down-to-earth image was all the more remarkable for someone who grew up in a suburb of Manhattan as part of the aristocracy and married aristocracy as well. 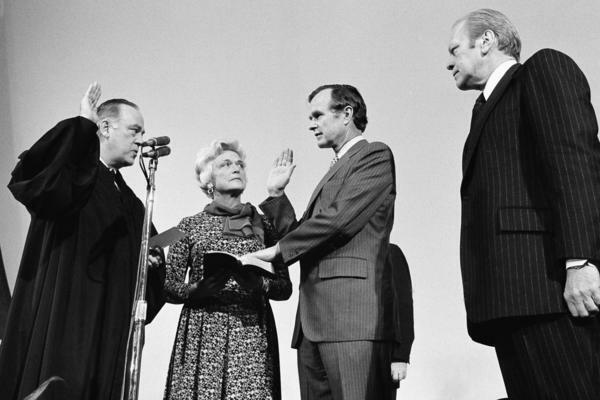 The daughter of a magazine publisher and granddaughter of a state supreme court justice, Barbara Pierce was home from boarding school at a holiday dance when she met George Herbert Walker Bush — the son of a U.S. senator from a prominent Yankee family. She described falling head over heels in her memoir. "Sweet sixteen and never been kissed, has been written about me and it was true," she quipped. "I floated into my room and kept the poor girl I was rooming with awake all night, while I made her listen to how Poppy Bush was the greatest living human on the face of the earth." They got engaged just before Bush shipped off to war. When he returned, she dropped out of Smith College to become Mrs. George Bush. She would then make some 30 moves following her husband, through naval training and to Yale University, where she delivered George W. Bush — the first of their six children — and then to Texas, where Bush would start his career in the oil business. Political aide and family friend Chase Untermeyer says that was a formative experience for this elite young woman from the East. "No matter what your background is, if you go to dusty, West Texas in the late 1940s, you are very much down to earth because the earth is all around you," he said. "There wasn't much fanciness about that lifestyle, and it was a great leveler." "Barbara Bush spent her 20s and 30s in the traditional role of wife and mother," recalled former neighbor Charlie Younger years later. "She was the June Cleaver prototype. She would dress in a dress, being the perfect mom, the perfect wife, cooking, cleaning — all the things that full-time, stay-at-home moms did back then." 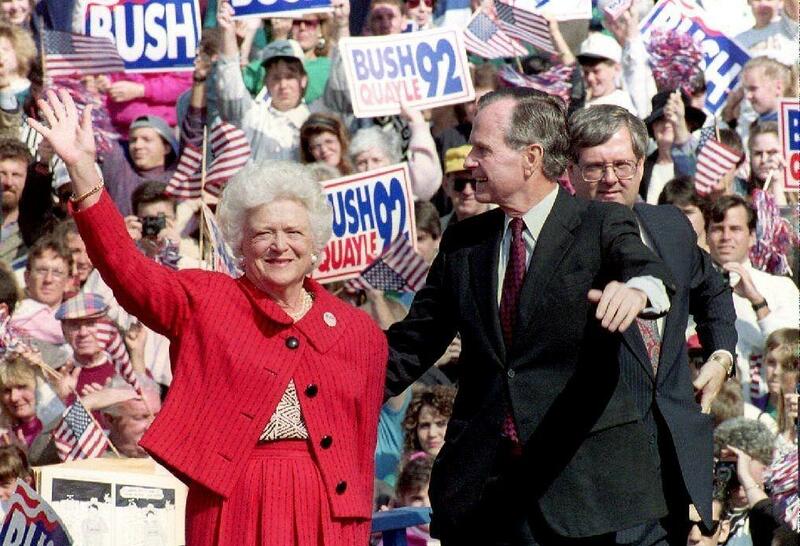 When her husband dived into politics, Barbara Bush dutifully took on the role of political wife, campaigning for him. But longtime family friend Rob Mossbacher Jr. said her supportiveness should not be mistaken for submissiveness. "She was as far away from a 'Stepford wife,' or some sort of namby-pamby, you know, 'sweetness and light' [wife] that you could get," Mossbacher said. Indeed, Barbara Bush — known as the "Silver Fox" — could be as tough as she could be charming. Her grandkids named her "The Enforcer." But the rough-and-tumble of politics roiled her at times — especially, as she herself said, attacks aimed at her son, George W. Bush. "Sometimes I just wanna give people a piece of my mind," she once quipped. "But of course, as George would say, 'Wouldn't be prudent!' 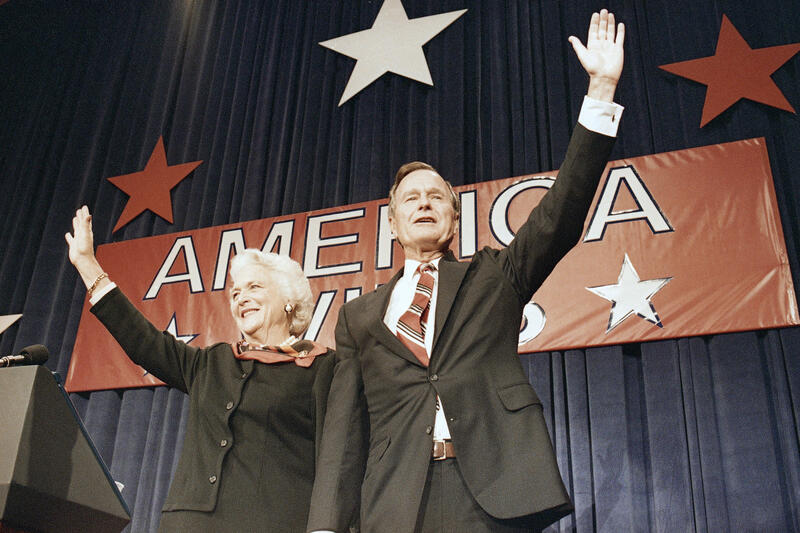 "
When her second son, Jeb Bush, first considered running for president as had his father and brother, Barbara Bush demurred: "We've had enough Bushes," she said. But in 2015, when he jumped in, she changed her tune, and at 90 years old, she hit the campaign trail to try to elect a third President Bush. True to her character, Bush couldn't hold back when she was asked by CNN about Jeb Bush's then-bitter rival, Donald Trump, who had called her son "dumb as a rock." "I'm sick of him," she said. "I don't understand why people are for him." Perhaps her best-known barb was aimed at her husband's 1984 vice presidential opponent, Geraldine Ferraro, who had called him rich and out of touch. Bush shot back that she couldn't say what Ferraro was ... but it rhymed with rich. "It was a spontaneous quip that might best not have been made public," said former Bush aide Craig Fuller — but "you didn't find her backing down." On issues of policy, Bush tended to tread more lightly. She was said to privately support abortion rights, but on the record would hold her tongue. "I believe if you are an elected official, you can speak up," she explained. "But if you haven't run for dogcatcher, never publicly." 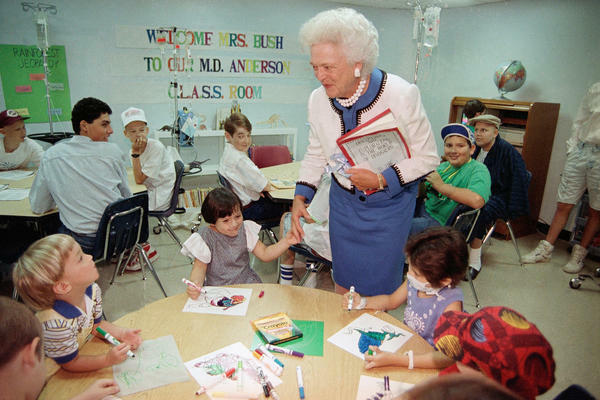 "Barbara Bush understood the political version of the Hippocratic oath, 'First do no harm,' " said McGill University history professor Gill Troy. "Mamie Eisenhower always said, 'Ike runs the country and I make the lamb chops.' And Barbara Bush definitely embraced that." Bush also tried to avoid making waves in selecting her pet cause of literacy. She tirelessly promoted literacy as a way to help solve everything from teen pregnancy and inner-city violence to AIDS. "If every man, woman and child in America could read, write and comprehend, we could find easier answers to so many of our other social problems," she said. Bush was also a best-selling author, beloved for the books she wrote in the voice of her dog Millie. But her role as first lady, wife and mother actually sparked something of a backlash, when she was chosen to speak at Wellesley College commencement in 1990. Some students protested the choice, saying that a woman most famous for her husband's career wasn't the ideal role model. But true to form, Bush took no prisoners, and she told her audience of graduates that family should trump career. "At the end of your life, you will never regret not having passed one more test, winning one more verdict, or not closing one more deal," she said. "You will regret time not spent with a husband, a child, a friend or a parent." Bush's personal life included some challenges, including the death of a 3-year-old daughter from leukemia and, years later, a bout of depression that left her feeling "like driving into a tree." But all in all, Barbara Bush considered herself blessed, especially, as she often said, for whom she married. "George Bush gave me the greatest life ever any living human being could have ever had, truthfully," she said. Former first lady Barbara Bush has died. She was 92 years old and had suffered from heart problems. Mrs. Bush opted to discontinue medical treatment over the weekend and focus instead on comfort care. That's according to the office of her husband, former President George H.W. Bush. A statement from her son, former president George W. Bush, called her a woman unlike any other who brought levity, love and literacy to millions. Mrs. Bush will go down in history as one of just two women in the United States to be both the wife of a U.S. president and also the mother of one. NPR's Tovia Smith has this look back at her life. TOVIA SMITH, BYLINE: From the moment she moved into the White House, Barbara Bush made it clear she was going to be a different kind of first lady than her very glamorous predecessor, Nancy Reagan. BARBARA BUSH: And speaking of glamour, I want you all to look at me very carefully. SMITH: She was as famous for her undyed hair and fake pearls as she was for her self-deprecating humor. BUSH: Please notice the hair, the makeup, designer clothes. MYRA GUTIN: Barbara Bush certainly wasn't afraid to laugh at herself. And I think she worked very hard to show that she was just a real person. She was not Nancy Reagan, who's a size two. SMITH: First Lady biographer Myra Gutin says it's why Bush was so popular. She was a throwback to old-fashioned values, and she pushed back against popular conventions of beauty. GUTIN: One time she said to a reporter, my mail is telling me that there are a lot of fat and overweight ladies in this country who are really happy that I'm going to be in the White House. That's vintage Barbara Bush. SMITH: Her down-to-earth image was all the more remarkable for someone who grew up in a suburb of Manhattan as part of the aristocracy and married aristocracy as well. The daughter of a magazine publisher and granddaughter of a state Supreme Court justice, Barbara Pierce was home from boarding school at a Holiday dance when she met George Herbert Walker Bush, son of a U.S. senator from a prominent Yankee family. BUSH: Sweet 16 and never been kissed has been written about me, and it was true. SMITH: In her memoir, Bush describes falling head over heels. BUSH: I floated into my room and kept the poor girl I was rooming with awake all night while I made her listen to how Poppy Bush was the greatest living human on the face of the Earth. SMITH: They got engaged just before Bush shipped off to war. And she dropped out of Smith College when he returned to become Mrs. George Bush. She would then make some 30 moves following her husband through naval training to Yale, where she delivered the first of their six children, George W. Bush, and then to Texas, where Bush would start his career in the oil business. Political aide and family friend Chase Untermeyer says that was a formative experience for this elite young woman from the East. CHASE UNTERMEYER: No matter what your background is, if you go to dusty West Texas in the late 1940s, you are very much down-to-earth 'cause the earth is all around you. There wasn't much fanciness about that lifestyle, and it was a great leveler. SMITH: Barbara Bush spent her 20s and 30s in the traditional role of wife and mother. When her husband dove into politics, she dutifully took on the role of political wife and campaigned for him, though longtime family friend Rob Mossbacher Jr. says her supportiveness should not be mistaken for submissiveness. ROBERT MOSBACHER JR: She was as far away from a Stepford wife or some sort of mamby-pamby (ph), you know, sweetness and light that you could get. 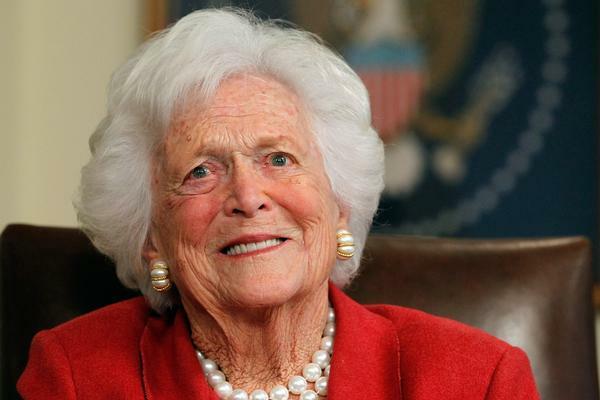 SMITH: Indeed known as the Silver Fox, Barbara Bush could be as tough as she could be charming. The rough-and-tumble of politics roiled her at times, especially, she said, when attacks were aimed at her son, George W. Bush. Her grandkids named her the enforcer. BUSH: Sometimes I just want to give people a piece of my mind. BUSH: But of course, as George would say - wouldn't be prudent. SMITH: When her other son, Jeb Bush, first considered running for president, too, Barbara Bush demurred, we've had enough Bushes. But in 2015 when he jumped in, she changed her tune. And at 90, she hit the campaign trail to try and elect a third President Bush. BUSH: He's everything we need in a president. SMITH: True to her character, Bush couldn't hold back when she was asked by CNN about Jeb's then-bitter-rival Donald Trump, who had called her son dumb as a rock. BUSH: I'm sick of him. I don't understand why people are for him. SMITH: Perhaps her best-known barb was aimed at her husband's 1984 vice presidential opponent, Geraldine Ferraro, who was attacking George W. Bush for being rich and out of touch. Mrs. Bush shot back that she couldn't say what Ferraro was, but it rhymed with rich. CRAIG FULLER: It was just kind of spontaneous quip that might best not be made public. FULLER: You didn't find her backing down. I would say that was pretty characteristic. SMITH: On policy issues, however, Mrs. Bush treaded more lightly. For example, she was said to privately support abortion rights but on the record would hold her tongue. BUSH: I believe if you are an elected official, you can speak up, but if you haven't run for dogcatcher - never publicly. SMITH: Mrs. Bush also tried to avoid making waves in selecting her pet cause of literacy. BUSH: (As herself) Hello. Nice to see you again, Big Bird. CAROLL SPINNEY: (As Big Bird) Oh, it's nice to see you, too. SMITH: She tirelessly promoted literacy as a way to help solve everything from teen pregnancy and inner-city violence to AIDS. BUSH: That if every man, woman and child in America could read, write and comprehend, we could find easier answers to so many of our other social problems. SMITH: Mrs. Bush was also a bestselling author beloved for the books she wrote in the voice of her dog Millie. But her role as first lady, wife and mother also sparked something of a backlash when she was picked to speak at Wellesley College commencement in 1990. Students protested that a woman most famous for her husband's career was not a good role model. 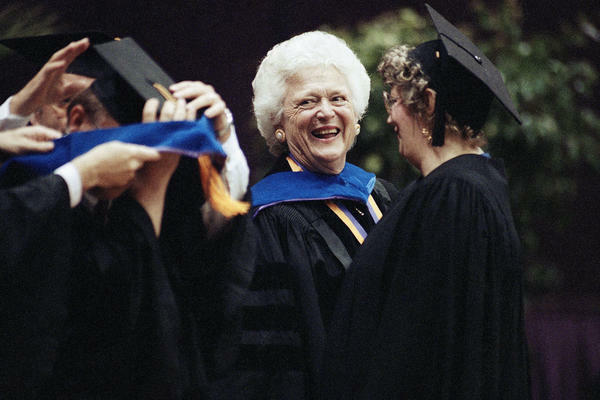 But true to form, Barbara Bush took no prisoners, telling grads that families should trump career. BUSH: At the end of your life, you will never regret not having passed one more test, winning one more verdict or not closing one more deal. You will regret time not spent with a husband, a child, a friend or a parent. SMITH: Mrs. Bush's personal life included challenges, including the death of a 3-year-old daughter from leukemia and, years later, a bout of depression that left her feeling, as she put it, like driving into a tree. But all in all, Barbara Bush considered herself blessed, especially, as she's often said, for who she married. BUSH: George Bush gave me the greatest life ever any living human could have ever had, truthfully. SMITH: Tovia Smith, NPR News. Transcript provided by NPR, Copyright NPR.